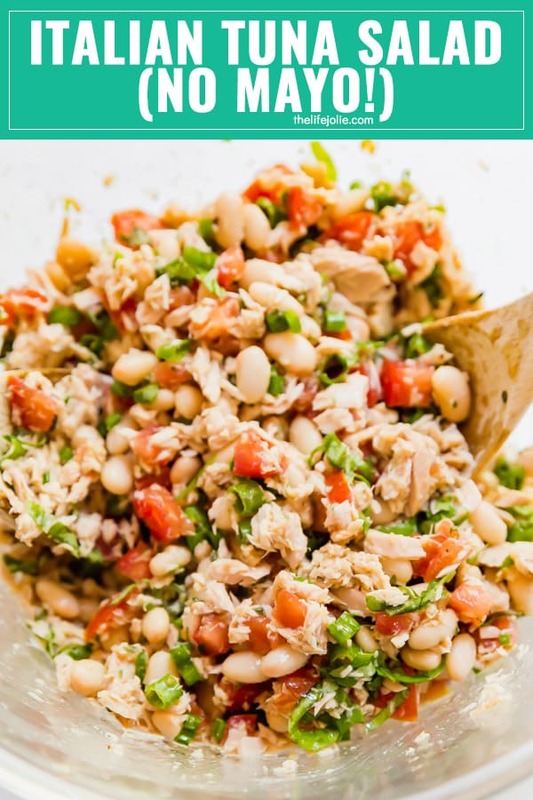 Italian Tuna Salad- a deliciously light and healthy tuna salad recipe with no mayo! 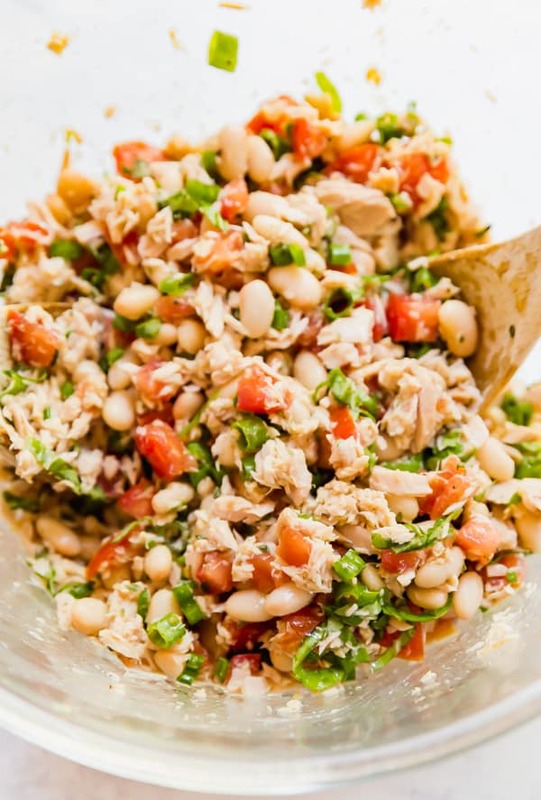 Italian Tuna Salad makes the perfect light and fresh lunch! 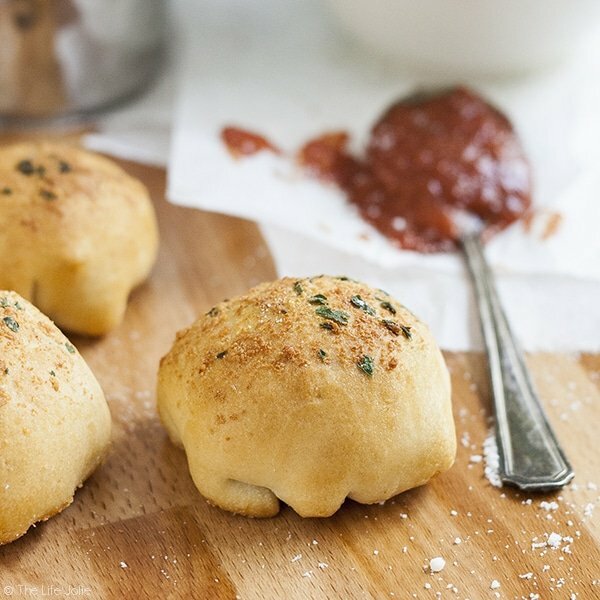 This is a healthy but satisfying option that is super easy and comes together in minutes. I’ve always been a big fan of tuna salad. Growing up, my mom would make it for us often. Hers was super simple; chunk light tuna with mayonnaise mixed in. Once in a while if she was feeling extra fancy she’d add chopped celery or top our sandwiches with dill pickles. It was the best tuna salad! I can also remember my Grandma Eve (my mom’s mom) making these very same sandwiches on the days us kids would go spend the day at the pool at her apartment. Those were super special swimming days because Grandma would pack us a picnic and she’d always make sure we had some sort of sweet treats if we finished our lunches. Now that I’m an adult I still adore a good tuna sandwich. Nowadays my tuna salad recipe is pretty similar to those of my youth, although I like to add in some sweet relish. I actually craved tuna salad sandwiches when I was pregnant with my first daughter! But it’s always fun to mix it up a bit and came up with a healthy tuna salad option so I figured a tuna salad without mayo was a good direction to head in. My theme was Italian because I really feel that the flavors you often find in Italian cooking would pair really well with canned tuna fish. 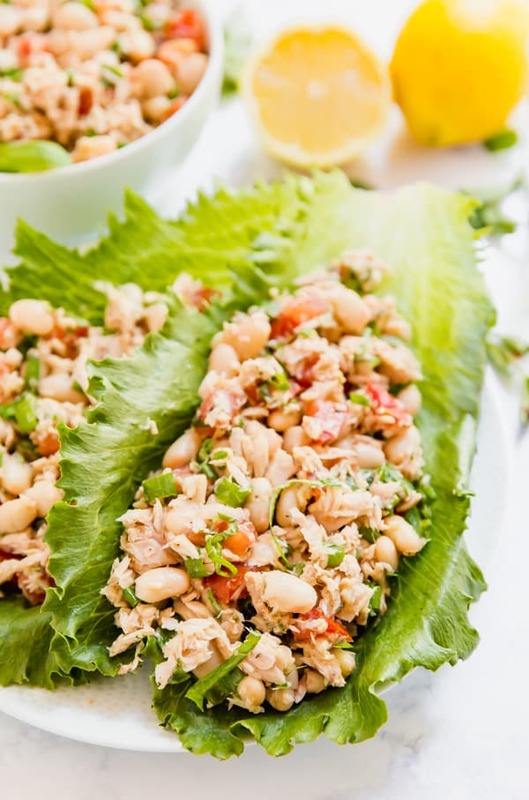 I chose to serve this easy tuna salad in lettuce wraps but it make be a really great sandwich as well. My mom, happened to be over helping me on the day I shot the photos of these (and subsequently devoured a few of these tuna lettuce wraps after I finished taking photos). 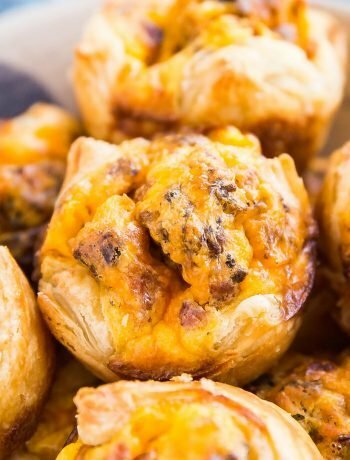 While she was eating them, she mentioned that this would also be excellent over a green salad and I agree! I used yellow fin tuna in water but you could totally use albacore if you prefer. My mom said she though it would be fantastic in tuna packed in oil. I haven’t tried this but I’m sure it would be tasty, although maybe not as healthy. 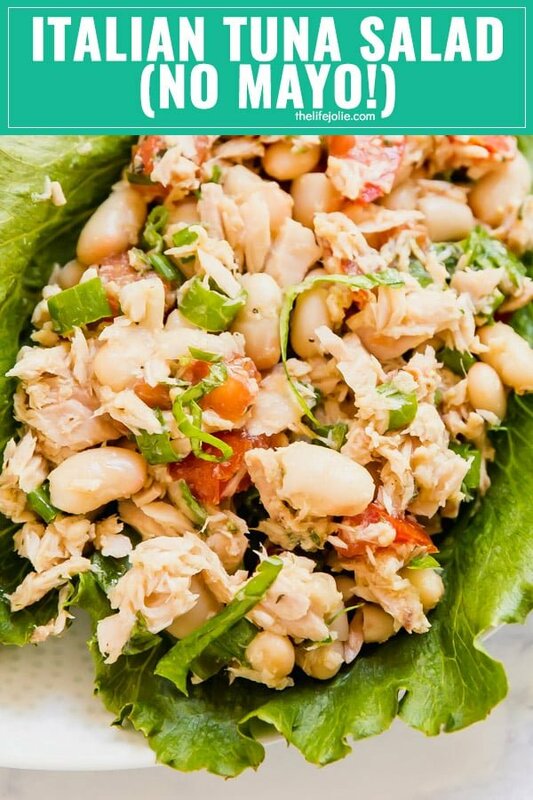 Make sure you drain your cans of tuna really well (unless you’re using tuna packed in oil, in which case you might leave the oil it’s packed in and reduce the amount of olive oil you add to the tuna salad). If you’re not planning on serving it right away, you might consider waiting to add the basil as it will wilt over time. It will still taste delicious, but it might not stay as pretty. 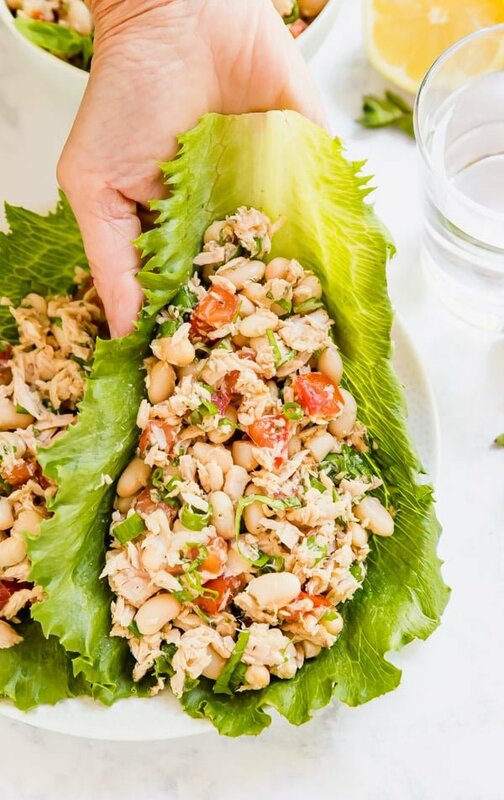 This is a great meal prep option in you’re looking for a light and healthy lunch option to bring to work. As always, taste as you mix and adjust the seasonings according to your taste! This lasts covered in the refrigerator for up to 4-5 days. 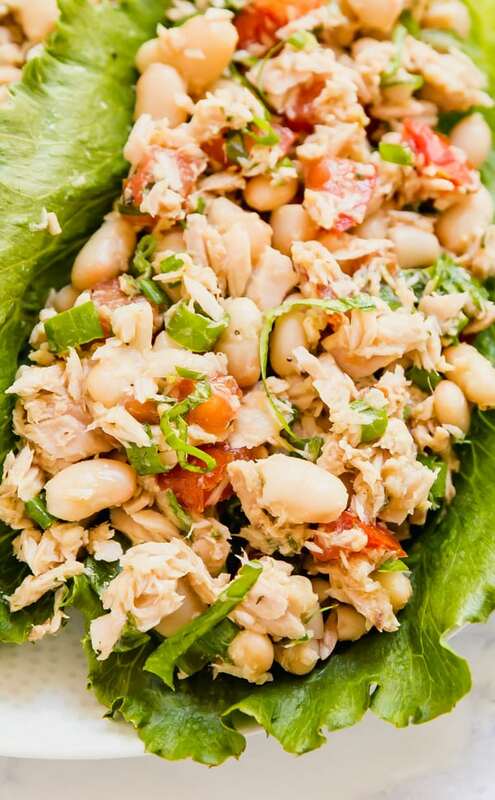 Looking for some other tuna recipes?